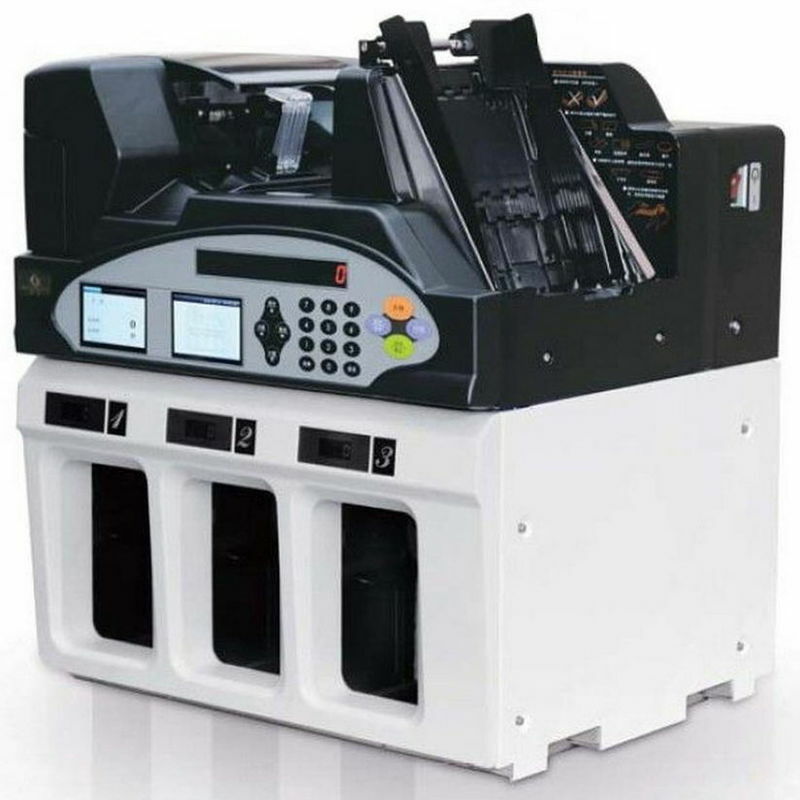 ● Adopted the cutting-edge CIS, DSP technology. Identification and control system use FPGA+DSP structure, more CPU in processing. 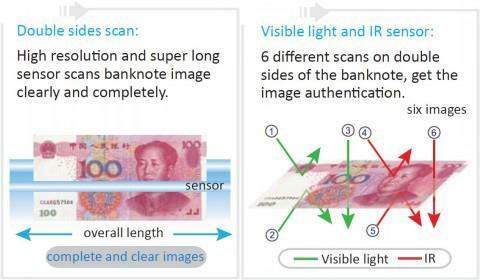 ● Auto detect counterfeit banknote by using Light Image, IR Image, Spectrum Image, Magnetic Image, UV, Magnetic Ink, Thread Metal, IR Penetration, Multipoint Thickness Measurement, etc. Error code indicated and alarm sound when find fake banknote. 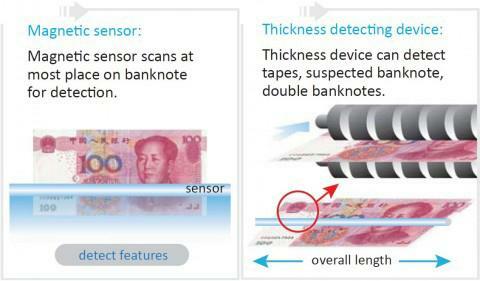 ● Detect incomplete, damaged, holes, fold, pen marks, oil, overlapped, spliced, tape and double on the banknote. ● Separate the suspected notes from damaged notes, easy to organize notes, reduce the worklad. 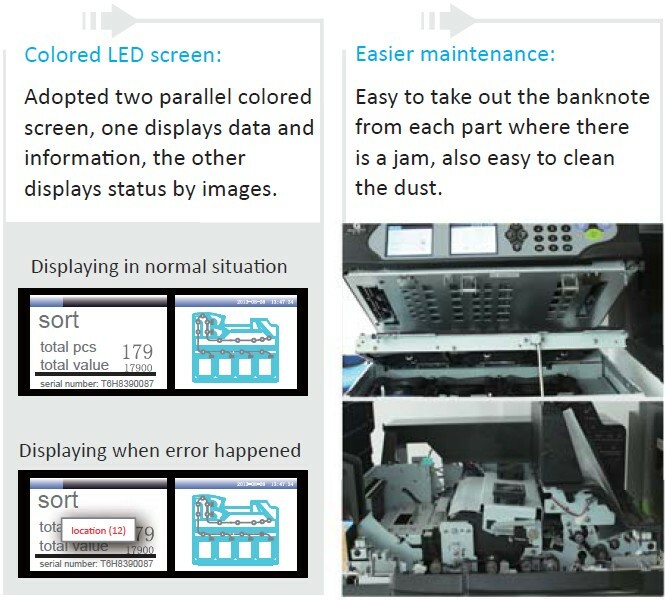 ● Have many functions, such as counting, version sorting, orientation sorting, sorting banknote for ATM machine, adding, batching, serial number checking and output, connecting LAN etc. and Display the banknote number of each pocket separately. ● Adjustable sensitivity, auto storage, self checking after being switched and displaying the error code, restorable to default setting.